Keep paint clean without wasting water! The McKee's 37 Waterless Wash On The Go Concentrate Refill Combo contains everything that you need to keep your car looking its best without wasting water or breaking the bank! Mix up a batch of waterless wash using McKee's 37 Waterless Wash On The Go Concentrate in the included 36 ounce Detail Bottle (using the threaded funnel to help!) then get to work washing our car. Whether the weather is bad, your community faces water restrictions, or you simply don't have access to a hose, the McKee's 37 Waterless Wash On The Go Concentrate Combo helps you keep your vehicle clean with a spritz and a swipe! We've even included a handful of super soft towels to get you started. McKee's 37 Waterless Wash On The Go Concentrate gives you the cleaning power and convenience of McKee's 37 Waterless Wash On The Go in a money-saving concentrate. McKee's 37 Waterless Wash On The Go Concentrate is formulated to clean well while it protects the paint with slicker shine-enhancing polymers. McKee's 37 Waterless Wash On The Go removes dirt and grime like a first rate car wash and has the added benefit of a clear, protective coating that enhances any surface. That's all you have to add to our 36 ounce spray bottle to create a quart of ready-to-use waterless wash! Simply add the appropriate amount of concentrate (pictured) and then fill the rest with water. The Premium Gold Microfiber Towel is made of incredibly soft and plush microfiber in a handy 16 x 16 inch size. It's perfect for quick detailing and pampers every surface it touches. The Premium Gold Microfiber Towel measures 16 x 16 inches and features an outstanding 70/30 blend of polyester and polyamide. The microfiber's weight is 380 g/m², making one very soft, thick towel! This 36 ounce Detail Bottle is perfect for all of your detailing needs. The durable PVC construction paired with a heavy-duty spray trigger make this a handy tool that's built to last! Measuring lines printed on the bottle make it easy to dilute your favorite detailing products, like McKee's 37 Waterless Wash On The Go Concentrate, and the wide base makes it less likely to tip over. The Threaded Refill Funnel makes refilling your waterless wash spray bottle easier than ever before. 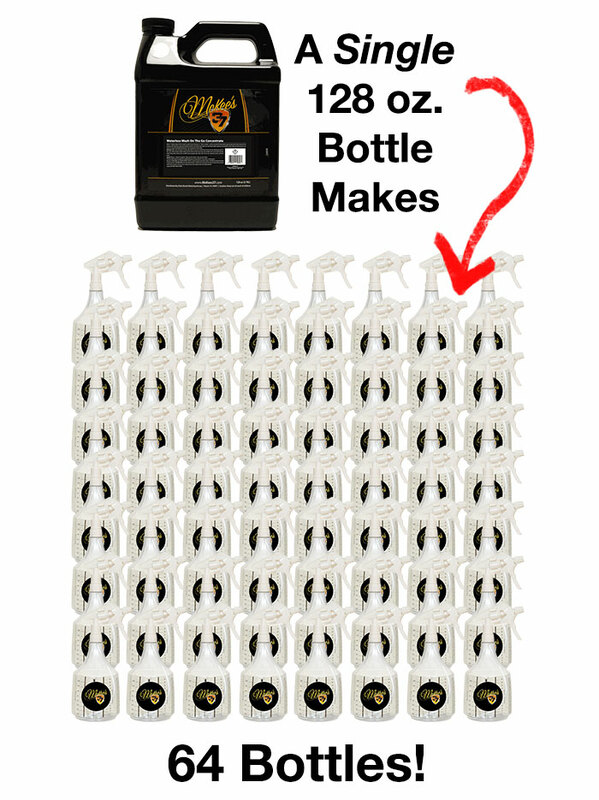 Featuring staggered threads that fit virtually any bottle from 4 – 35 ounces, a refill is as easy as screwing on a cap! The ingenious design even features a spout on the side so that if you accidentally overfill your spray bottle, you can simply pour any excess back into the gallon bottle without making a big mess. The convenient hook allows you to store the funnel on the gallon bottle itself so you'll always know where it is. A total retail value of $93.97, you save $13.98! McKee's 37 6-Pack Mix & Match - Bonus 3 Pack! McKee's 37 Tire Shine SiO2 Enhanced FREE BONUS! McKee's 37 Frost Bite Ice & Snow De-Icer Buy One, Get One FREE! McKee's 37 10 Minute Paint Sealant FREE Applicator!